The Hurrians (or Khurrites) were neither Semitics nor Indo-Europeans but their origins are obscure. They appear to have emerged between 2500-2000 BC, probably from the Caucuses mountains to the north of Mesopotamia, to occupy the upper Tigris Valley and the upper Euphrates (close to the Assyrians). This had previously been the centre of the Chalcolithic Halaf culture (see feature link, right). The end of the Akkadian empire at the hands of the Gutians at the start of the twenty-second century BC enabled the Hurrians to gain control of regions of northern Mesopotamia with no one apparently able to oppose them. Both Sumer and Egypt endured a short (climate-induced) dark age at this time. Records-keeping suffered, and short-lived dynasties or non-dynastic rulers emerged in cities such as Agade. From the beginning of the second millennium BC, Hurrians seemingly took control of what had been the Assyrian city of Arrapha (now known as Kirkuk, itself a derivative of the Assyrian name). They settled there as a majority population, perhaps at the expense of an Assyrian population. The city is located in what is now northern Iraq, about two hundred-and-fifty kilometres north of Baghdad, near the foot of the Zagros Mountains in Kurdistan. Not long after the first Hurrian cities were founded at Urkesh and Nawar in the Khabur Valley, Arrapha was 'founded' (a common term for a new group taking control of an old city) circa 2000 BC beside the River Hasa, in a region which contains archaeological remains that date back another thousand years before that. For a time it was subject to Mitanni overlordship while these later incomers temporarily dominated the Hurrians, but the city reached its greatest prominence in the eleventh and tenth centuries BC after it had been returned to Assyrian rule. Unfortunately, as for most things concerning the earlier Hurrians, not much is known about them except through archaeology. Having emerged as a recognisable group during the short dark age of the twenty-second century BC, the Hurrians have already founded kingdoms at Urkesh and Nawar, based around the two cities of the same name in northern Mesopotamia. Around this time, 2000 BC, they also form the small state of Arrapha in the same region, seemingly after coming to dominate the city to provide its majority population, possibly at the expense of Assyrians who could previously have dominated here. This state also includes the nearby city of Nuzi, which is governed by a mayor who is dependent upon Arrapha. Despite having been defeated by Tuthmosis III of Egypt at the Battle of Megiddo, Barattarna of Mitanni is still powerful enough to make Arrapha to his east a vassal state by this date. Again despite having lost the state of Amurru and several other Mitanni subjects in southern Syria, the Mitanni continue to be an important geopolitical power in the ancient Middle East. 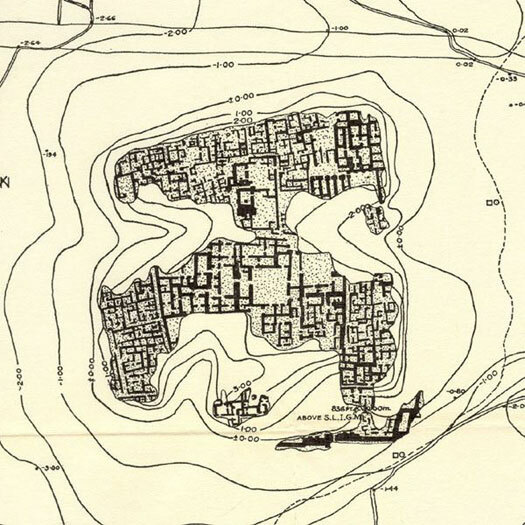 The town of Gasur (shown here in an archaeological sketch) was apparently founded during the Akkadian empire period in the late third millennium BC, before being taken over by Hurrians who renamed it Nuzi. King of Arrapha, vassal of Saushtatar of Mitanni. Ithiya is mentioned on a seal which has been sent to him by Saushtatar, ruler of Mitanni and son of Parshatatar. It discusses the reorganisation of the governorship of several regional towns - which Ithiya is to enact - while also making it clear that these governors shall not encroach upon one another's territory and none of them shall encroach upon the territory of Arrapha. From this it seems clear that Ithiya acknowledges Mitanni as his overlord, acts as Mitanni's key representative in the Arrapha region to the east of Mitanni, and also allows an approximate date to be given to his reign. Ashur, which lies on the road from Mitanni to Arrapha is not mentioned at all, showing that the Assyrians are still a very minor, subject group. Ruler, or simply the father of a ruler? Ithi-Teshup is mentioned on a seal that is found by archaeologists at Arrapha's subsidiary town of Nuzi. He is the son of Kibi Teshup and king of Arrapha. Whether is father is or had been king of Arrapha is unclear. Ithi-Teshup claims the protection of the gods Adad and Ishtar of Lubdi. A date for his reign cannot be produced, but it would appear to fall in the period between about 1450-1300 BC. Perhaps a decade before this date the Hurrians of Mitanni had been devastatingly defeated by the Hittites in a shock reversal of fortunes. Also losing territory in Syria to the Hittites, the Hurrians now became Hittite vassals and their kingdom rapidly declines. A confused period develops with rival claimants and short-lived rulers hastening the process of decline. Tushratta of Mitanni is assassinated around this time, possibly by his successor, sparking a fresh dynastic struggle which allows the resurgent Assyrians to reclaim the important administrative centre of Nuzi on the edge of the kingdom. It seems likely that Arrapha is lost at the same time when it is destroyed by the Assyrians.